It’s morning, I woke up as usual, had breakfast, and washed my face, only to realize something. No, I already knew about it, just that my heart just caught up to reality. The sleeves of the school uniform I wore for three years no longer fit me. At the end of February, I took the second exam. Not even a week passed, and it was the graduation ceremony. Yesterday’s the results announcements. For the past few days, I was scrambling around. I intended to check my number on the computer, to see if I made it, but dad had a peek at it earlier. Congratulations, so he said over the phone, his voice shaking. Thank you. That was the brief conversation we had. Once I hung up, elation rose up my heart. I changed into shirt and jeans, and put on a cardigan, before heading down the road to school I walked for three years. During mid-February, there’s lots of snow piled up, but at this point, it’s already Spring. With the warm sun shining down, the snow vanished without a trace. I looked at the sky blue like water as I kept walking, and spotted a familiar face. It’s been a week since we met, right? Before then, we would meet every single day. It’s weird. This human relationship thing can easily break like this if neither of us maintain it. Those things I don’t ever want to give up on, I’ll have to keep reaching my hands out for them. There were few pedestrians on this working day, and there was a little silhouette before us, nobody else to be seen. As we approached it, it seemed the silhouette was approaching us, being a little bigger. Despite that, we’re so far away that we can’t determine each other’s gender. Will that silhouette approach us, pass us by, or turn away on the way? I said with a proud look, and Akane sighed, seemingly having given up on something. For every word I said, Akane’s words clearly looked increasing annoyed. Just looking at her mood, I knew the answer. Ahh, she’s really angry. No, she’s just sulking. Once I said that, Akane pinched my face. Anyway, it hurts. Akane pinched my other cheek with her other hand. Yay, yay, she fooled around as she tugged on my cheeks to both sides. Seriously, what’s this? It really hurts. Puhahaha, she couldn’t help but laugh. You’re really ugly, she said. My cheeks are pulled so much, I couldn’t open my mouth, so I couldn’t answer properly. It seemed Akane too knew as she finally let go. Once I had such a thought of relief, I got slapped by her with both hands. This hurts five times more than before. I rubbed my cheeks, nodding. 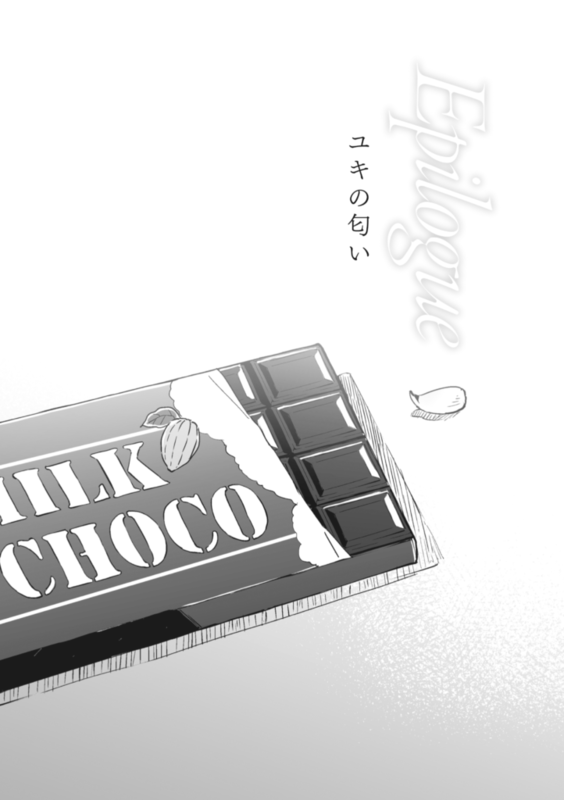 It’s a common chocolate. Yes, it’s sold at the nearby convenience store, and doesn’t have packaging. I often ate such chocolate in middle school, but the taste seemed different from what I ate back then. It feels really sweet. “You ask who, but it doesn’t matter now, right? That person probably mustered all her courage to deliver that chocolate to you. Right now, the chocolate’s in your hands. Yep, that’s right. Her love might have been repaid. Such love does exist anyway. Look, personally, I don’t think unrequited love is necessarily meaningly. Once I was told of that, I didn’t pursue the matter further. Over the past 18 years, I never had a romance with anyone. For all my life, I never knew of the fearless passion to think of the world as the enemy, and neight did I know of any scorching pain in my heart. Relax, you know love very well. So Akane denied what I said. Akane, walking backwards the whole time, turned around, and continued with her back facing me. After saying that, Akane stopped talking. Her back clearly had the words ‘don’t ask’ inscribed on it. That moment, I finally noticed something. The silhouette that should be far from us passed us by. We chatted for a long time, huh? Seemed like it’s a female. The long hairlocks entered a corner of my eyes for a moment, before leaving. I didn’t get to see her. The sweet fragrance of spring however was proof that she once existed, lingering in the air. Suddenly, a gust blew by, pushing my back. A voice came along with it. I felt that I was called by the latter bit of my name. Hearing this for the first time, I hurriedly turned back, but there was nobody behind. Akane noticed me stopping, and turned to look towards me. The next moment, we were both shocked, at a loss for words. Before us, there was a breathtakingly beautiful scenery. In the spring breeze, something akin to white light particles glittered, as though blessing the world. –The sakura petals are dancing. I opened my palm, gently grasped it, and opened it to see a white petal lying on it. The petal didn’t melt because of my palm, and it got taken by the breeze again, flying to a distant unknown. To a place I couldn’t reach. I was feeling a little forlorn. Why’s that? I sighed, and inhaled hard at this fresh air of spring. I recalled myself playing a snowball fight against the elementary school kids this Winter. To split teams, we used the sakura perfume. The snow with that fragrance hit my face, bringing much pain and cold. That, along with the sakura fragrance that followed, was ingrained deeply in my mind. Snow giving off sakura fragrance. Two things that definitely couldn’t coexist definitely meshed together. Isn’t that interesting? There’s nothing weird about that. Most likely, it’s called a miracle. I believe that in the future, every spring, I’ll remember the melted snow. For some reason, that alone is enough for me to happy about. In my head there will definitely always exist my personal fairytale-like ending, where Yoshi remembers everything and the both of them stay together. I don’t think this is a very great story, it is very confusing.